Following the issue of wind turbines impacting human health? Jim Cummings' Acoustic Ecology Institute reports have been a favourite resource of mine on the issue for some time. I think he makes some excellent points in reporting on a settlement in Michigan - one that followed shortly after a health board in Wisconsin declared an industrial wind site a public health hazard. ...it’s essential that enough of a safety factor is built in to the sound models to account for known variability in sound production (how loud the blades are in various unsteady wind conditions) and sound propagation (how far sound travels as it gradually loses power). Regular readers will know that variability is indeed, as Howe mentioned, often more than the simplified 3dB margin of error that was neglected here (see AEI’s 2012 report). The second half the lesson is related: when noise limits—for the sound of the turbines when it reaches nearby homes—are set as high as 45dBA, they will be regularly audible at these homes, and likely well above night-time ambient sound levels. As many acousticians have stressed for years, these situations are very apt to trigger a significant number of complaints, especially if there are dozens of homes in that nearby range. 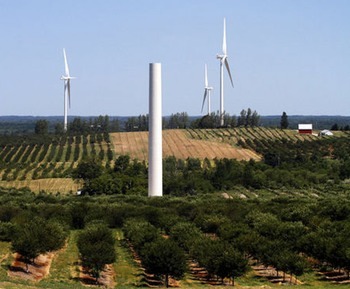 Here, we had the worst of both worlds: turbine siting plans that pushed sound right at the limit into nearby homes, and a limit that was on the high end of tolerability for many neighbors. Indeed, after one such cautionary report was presented to the Mason County Planning Board, it decided to lower the limit to 40dB, but that change was revoked after push-back from Consumers Energy. the financial and possible operational details are confidential (2 later additional litigants are yet to settle, but negotiations are ongoing). While many such lawsuits languish, as it can be very hard to prove causality of health effects or to prove nuisance, it is always notable when a company decides it’s more advantageous to settle than to push through a court hearing (which was set to begin, with the jury already seated). This is the latest of several such suits that were settled behind closed doors—other high profile compensation cases include Mars Hill, Maine and the Davis family in the UK, while property buy-outs of people who’ve either moved from their homes or become vocal about their issues are widespread, if not common, including a recent buy-out settlement with a family in Vermont, and purchases of multiple homes in Ontario’s Bruce and Dufferin Counties. It’s unfortunate that confidentiality clauses leave the rest of us in the dark, for one of the ways forward is for the wind industry to more willingly compensate those most impacted by their operations, and these cases could offer some guidance as to what level of compensation may be mutually agreeable. Read the entire article at AEI news - and if you're very curious about the issue AEI’s 2012 report is an excellent resource. Wind turbine impacts on human health were also in the news recently due to Wisconsin's Brown County Health Board declaring the Shirley Wind Farm a public health hazard.